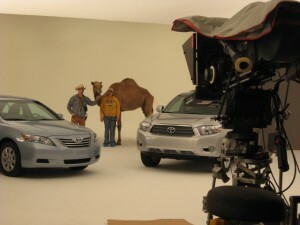 Toyota commercial, national release. Soundstage in Dallas, Texas. Texas Camel Corps provides Bactrian and Arabian camels with authentic equipment. Camels are trained to ride and safety instruction is available for cast and crew. USDA licensed and insured. Donkeys also available. Credits include feature film “A Texas Funeral”, a nationally broadcast Toyota commercial, two programs for the History Channel, a nationally broadcast Exxon commercial and many more. The Texas Camel Corps is listed with the Texas Film Commission.